Whom death hath brought unto his end. It looks like the "AD" was added in after the rest of the line was finished. Also, this is one of the more pathetic original verses I've seen. This stone looks like it was carved by the same carver who made the "She that lies here needs no vercifying" gravestone in Malden. This stone looks like it was carved by a member of the Soule family. I'm not sure how Zachariah and Mary were related to the carvers, but it doesn't seem presumptuous to assume that there was some connection. 1 month & 9 days. will GOD bring with him. I don't know why the carver decided to go with all caps on the left and a mix of upper and lower cases on the right. 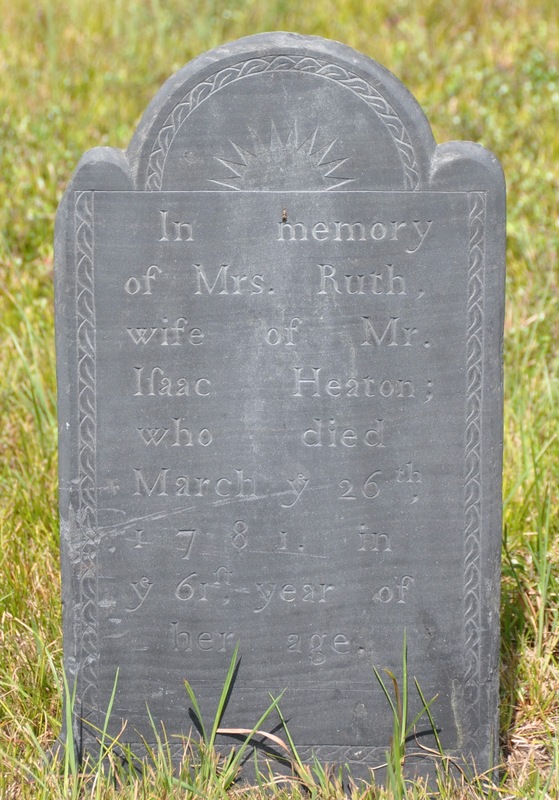 Since 20 years elapsed between the deaths of Katherine and Shem, it seems possible that the two sections of this stone may have been carved at different times. Shem Drowne was a coppersmith/tinsmith in 18th-century Boston. 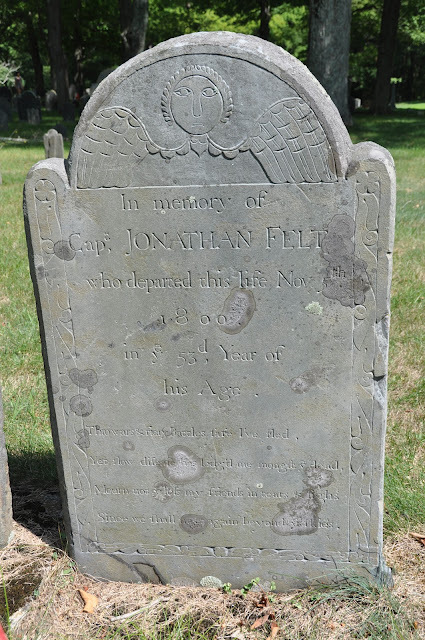 He is best known for making the grasshopper weathervane for Faneuil Hall (1742). He made other weathervanes, too: the Indian Archer for the Province House (1716), a rooster for the First Church of Cambridge (1721), and the swallowtail banner for Old North Church (1740). 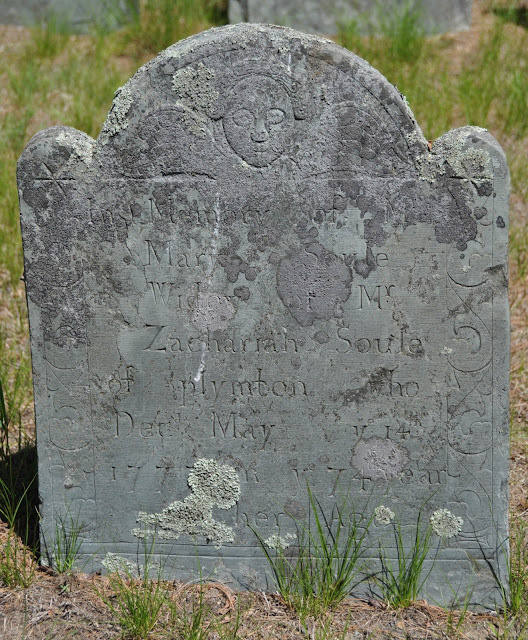 According to the Samuel Abbott Green transcription of Groton gravestones, local legend claimed that Susanna Quailes was one of the women who arrested Capt. Leonard Whiting in 1775. J.L. 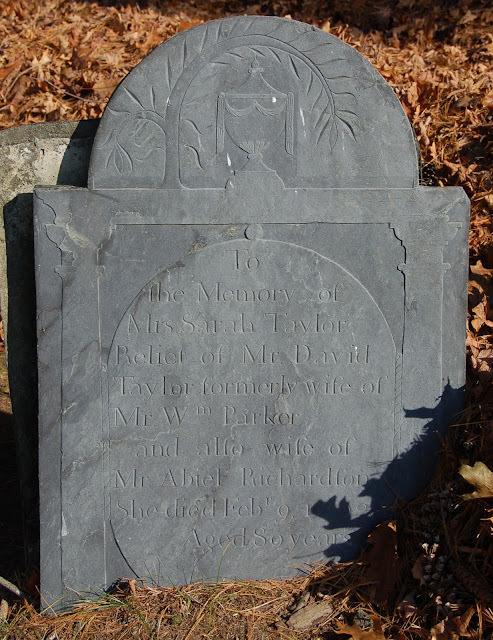 Bell of Boston 1775 wrote a series of posts about this alleged incident in August. This is a lovely stone in wonderful condition. I wonder why John Stevens decided to use "ye" in "Novemr: ye 21st," but use "the" in "Decembr: the 1st." I don't know what letters those are supposed to be in the surname. Two lowercase ts? Does anyone know if this is an obsolete way of writing the "Mc" prefix? This week, Andrew Sullivan published a 19th-century photo (c. 1870s) submitted by a reader who claimed that it depicts "a would-be transsexual." The person in question (far left) has not been positively identified, but he/she has short hair and the photo is labeled, "Howard." Sometimes viewing things through a 21st century lens can be very misleading. I think there is a pretty good chance this young man is just a late bloomer and not a transsexual. Most noticeably, he does not appear to be making any attempt to actually look like a girl. He's just in a dress. Of course I may be wrong, as I'm not an expert on the history of the practice of breeching, but I remember seeing pictures of my grandfather in a dress when he was at least five or six and nobody assumed he was a transsexual. 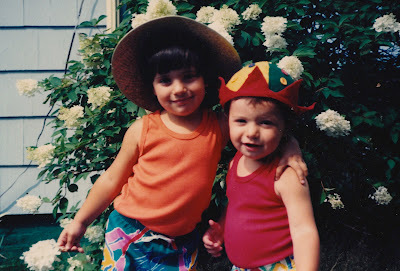 First, dresses were for children — boys were breeched when they were kindergarten age. The person in the photo is an adolescent, not a child. 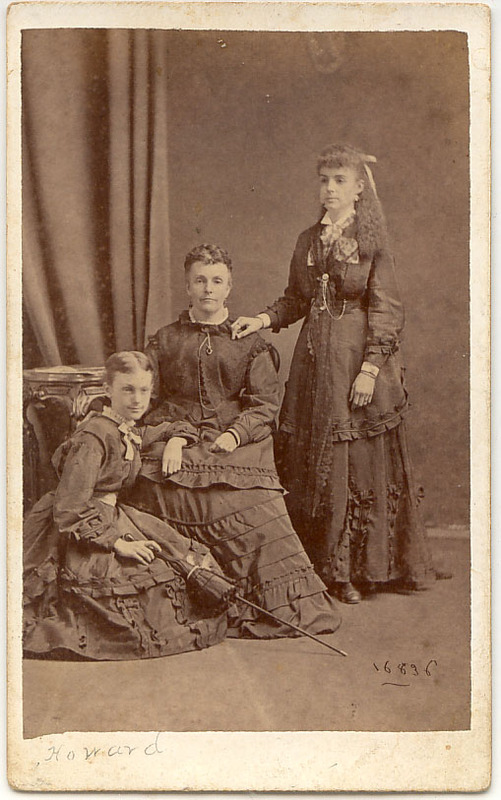 Victorian boys sometimes wore military-style tunics over blousy pants until age 10 or 12, but this person is wearing an adolescent girl's dress. Second, the reader is wrong when he/she says that there is no "attempt to actually look like a girl." As we've seen before, hair parted in the center is a strong indicator that the subject is female. The other adolescent in this picture has a more cutting-edge hairstyle: bangs. The prop, a parasol, is also a strong signifier of femininity. The second reader makes a good point about the conclusions drawn by the first, but his/her supporting evidence falls short. Still, I am inclined to be skeptical about the possibility that the photo depicts a young boy. The original poster just makes too many assumptions. For instance, the person on the left looks like a boy to us because he/she has short hair. Yet, Victorian girls sometimes sported brutally short haircuts, particularly when they were recovering from serious illnesses. When you hear hoofbeats, think horses, not zebras. Could this be a photo of a boy in a dress? Sure. But I wouldn't bet on it. 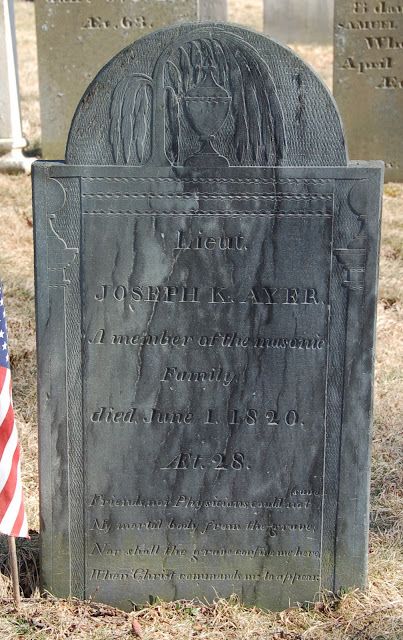 Here's another example of a father and child buried together. Zebina is really scraping the bottom of the Biblical names barrel. He is only mentioned once (Ezra 10:43) — he is one of the many, many Israelites who took a foreign wife in Babylon. See also Noadiah. 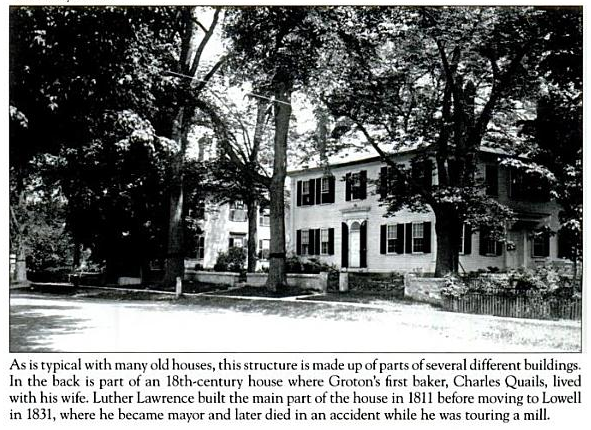 Apparently, the citizens of Hadley had a thing for obscure names. 10: But man dieth, and wasteth away: yea, man giveth up the ghost, and where is he? 12: So man lieth down, and riseth not: till the heavens be no more, they shall not awake, nor be raised out of their sleep. When Christ commands me to appear. This is an unusual stone. It is rare to find a monument that commemorates two adult men who are not obviously related to one another. Sometimes, unrelated individuals who die together in accidents are buried together, but Burtt and Wood died more than a decade apart. Might they have been employees of the same company? Or servants of the same master? I don't know and their names are common enough that I haven't had much luck finding them. Note also the practice carvings beneath the ground line. Adieu, dearest husband! thy sufferings are o'er! And burst upon thy famished soul. 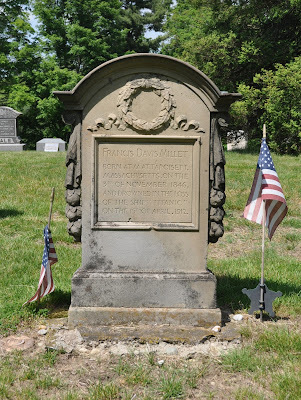 Francis Davis Millet was a notable American painter. This is a hop out of chronology for me, but I am fascinated by cenotaphs dedicated to people who died at sea. This is the rarest of gravestones: a gravestone that marks an actual grave for someone who died at sea. Millet's body was recovered from the debris in the aftermath of the sinking and was returned to Massachusetts. Since we shall meet again beyond ye skies. This cumbersome verse makes reference to Jonathan Felt's extensive service during the Revolutionary War. 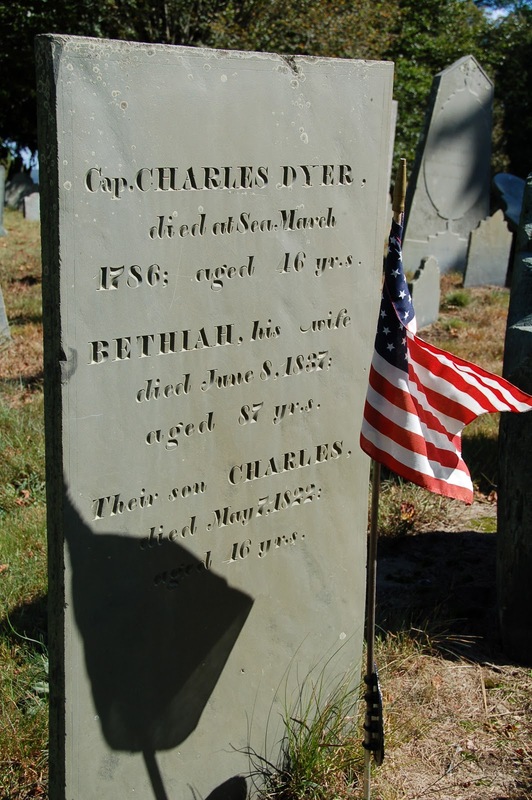 He responded to the Lexington Alarm on April 19, 1775 and served through the war until the Yorktown campaign. 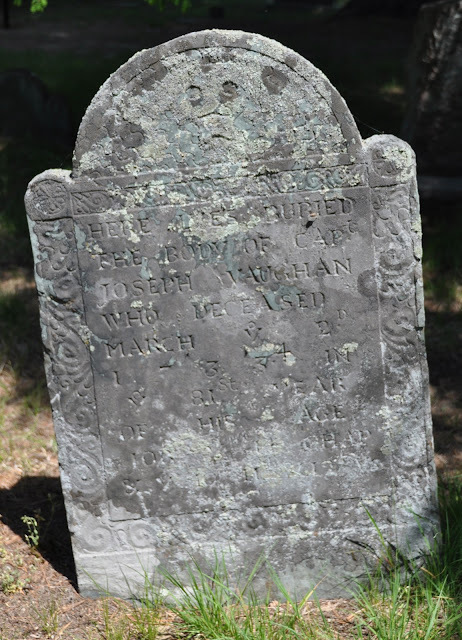 After the war, Felt returned to Wrentham, where he served as a Justice of the Peace until dying of consumption in 1800. He was a member of the the Society of the Cincinnati. Also of note: Jonathan's mother's name was Lovewell Wells Felt. 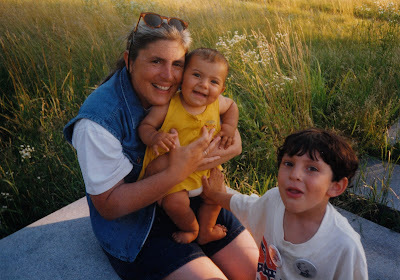 Let me say that again: she was born Lovewell Wells and became Lovewell Felt. Is there room for her in my novel? 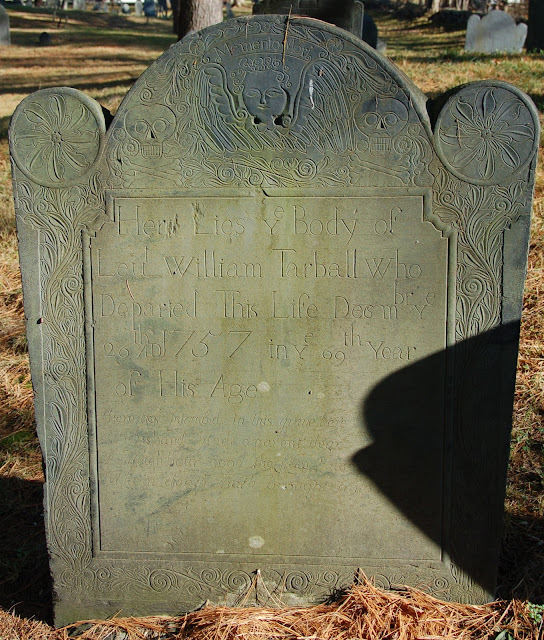 this Life August 31st: 1751. Aged 34 yeas & 10 days. Years, 1 month & 25 days. An Infant dear, all lies here. And mingle with our dust. This is a crappy picture, but I wanted to post it anyway because the shape of the stone is intriguing. Although the stone has an irregular shape, the placement of the words shows that the stone was that shape before it was carved. Little or no effort was made to shape the stone into a regular rectangle , though the edges may have been smoothed. I have no idea why the carver decided to put the smaller edge on the bottom, rather than putting the widest side at the base. It seems reasonable to assume that the carver was not a professional working in a shop, but, at the same time, the lettering isn't all that bad. Could this have been carved by someone who was used to lettering/carving in another medium? 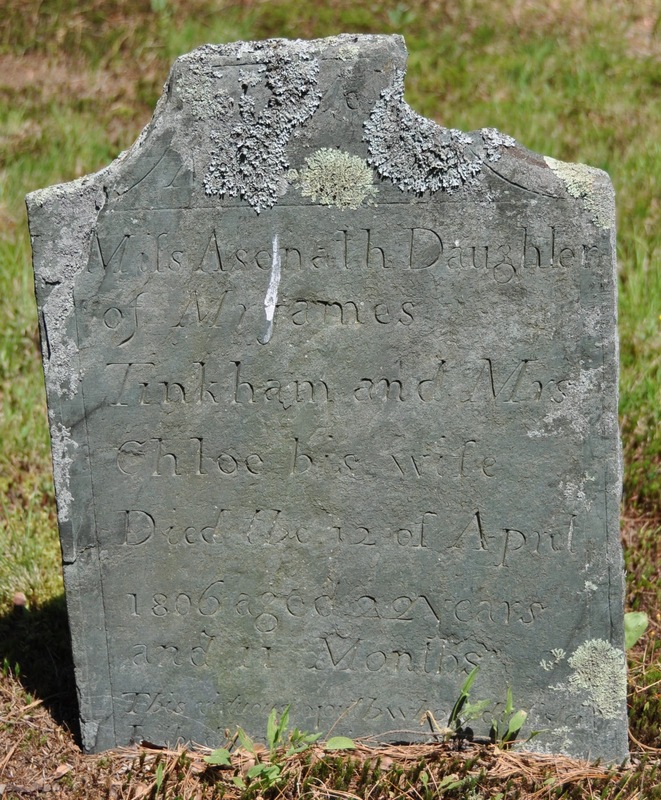 This gravestone is a relatively early survival for the Wrentham graveyard. 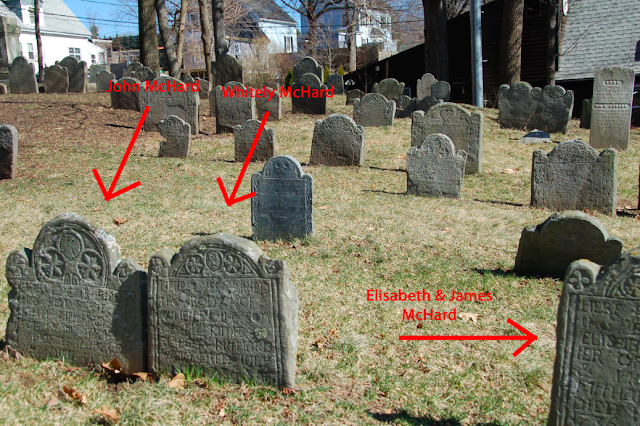 The graveyard is very old, but most of the stones are post-1770. 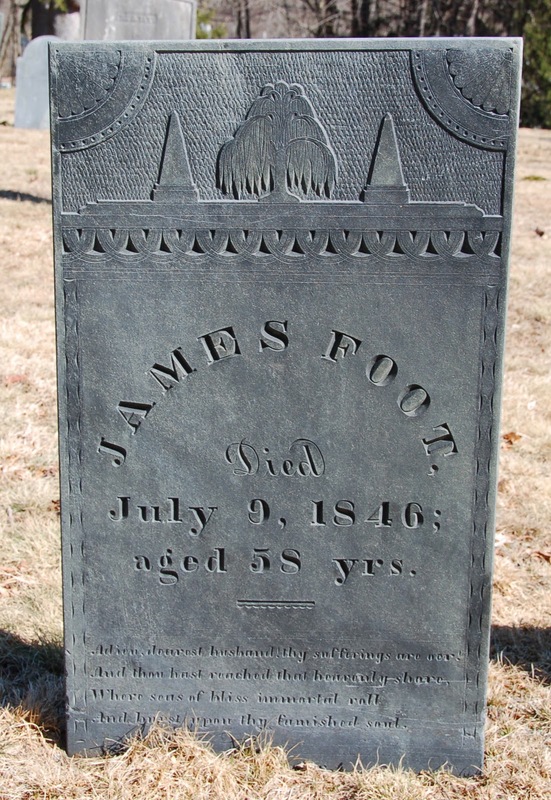 Many of the pre-1750 stones are from Boston or Providence, while this one looks local. 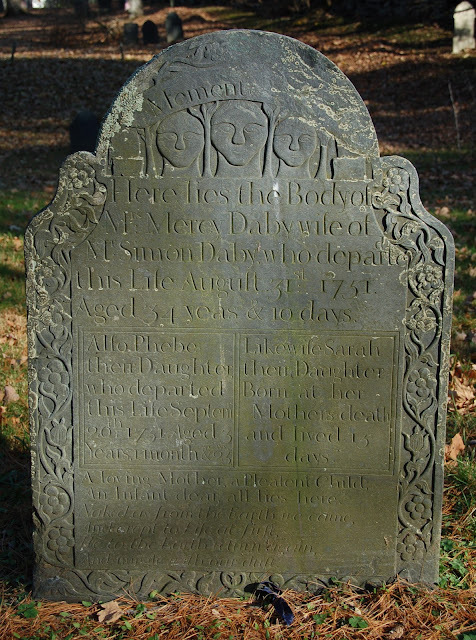 Yet, the text follows the conventions of gravestones fairly closely, even while the form does not. 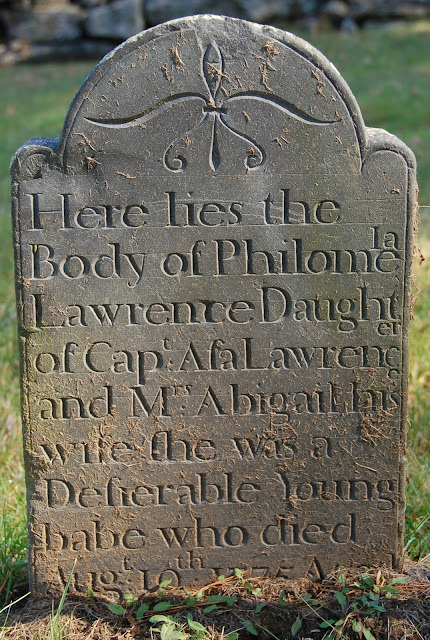 The carver, whoever he was, was probably familiar with professionally cut gravestones, owing to his use of conventions such as Decd" and the order of the text. His style is old-fashioned — note the cross on the capital I — but not exactly rough. 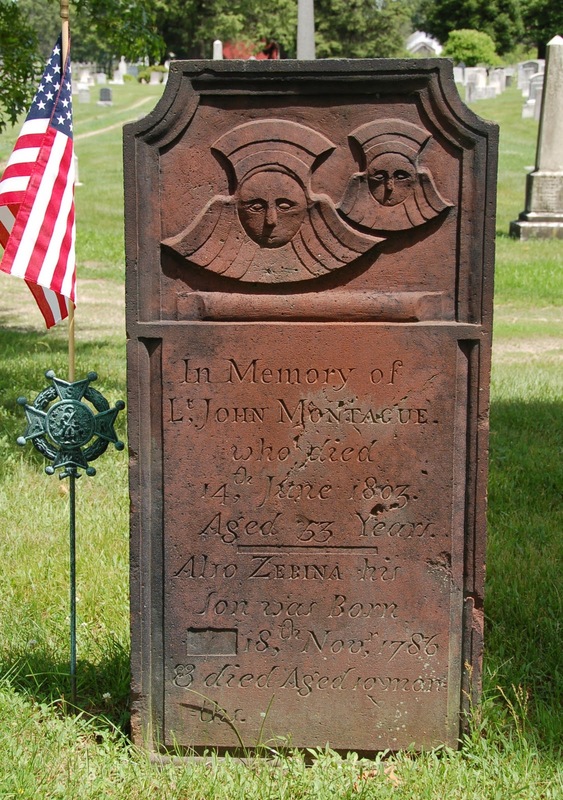 Is it possible that he may have carved wooden grave markers? That might explain the good letters and the wonky shape here.